In Gingrich's Past, A Lesson On Ambition The former House speaker began his career as a history professor at West Georgia College. "He thought he could have some kind of impact, to get kids to think," says a friend and former colleague. "But he really wanted to get into politics." 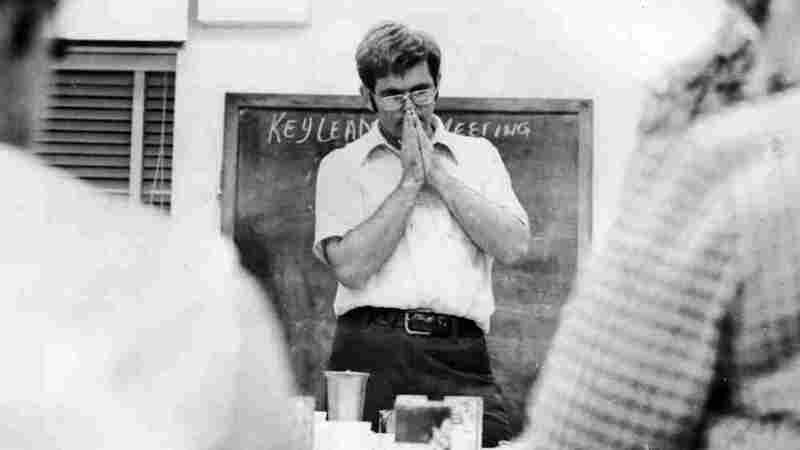 Newt Gingrich was in his 20s when he was hired at West Georgia College as a history professor. He had just returned from Belgium, where he was doing research for his doctoral dissertation. "He was very much a person of intellect," says Mel Steeley, who taught history at the college for four decades and helped bring Gingrich to the school in 1970. "He would wander across campus and didn't notice people. He'd have something in his mind, always be thinking about something. When he first came, you kind of wondered if he was a student or a professor." Steeley says he and Gingrich became close friends, with Steeley later working on Gingrich's campaigns and on his congressional staff. He says the man who would become speaker of the House realized in college that he would not go into the Army as his father had done. "He had bad eyes; he had bad feet," Steeley says. "And his dad liked the idea of him being a professor. He thought that was good." He thought he could have some kind of impact, to get kids to think, to look at the world and so forth. But he really wanted to get into politics. So Gingrich decided to become an educator. "He thought he could have some kind of impact, to get kids to think, to look at the world and so forth," says Steeley. "But he really wanted to get into politics." It was clear that Gingrich was ambitious, says Jim Gay, who also taught history at West Georgia and shared an office with Gingrich. Gay recalls one early conversation where colleagues mentioned the university president had an open-door policy. "Within a breath of that coming out of that person's mouth, Newt shot out the door, heading for the president's office — going to get his ear about ideas or something he had," says Gay. "He was always looking for avenues that would advance him." By 1972, Steeley says, Gingrich wanted to run for office — but not by starting small. He wanted to run for Congress because he believed he could win. "He convinced me, showing me the data, that it was possible. And so we decided in the '74 campaign that he would run." 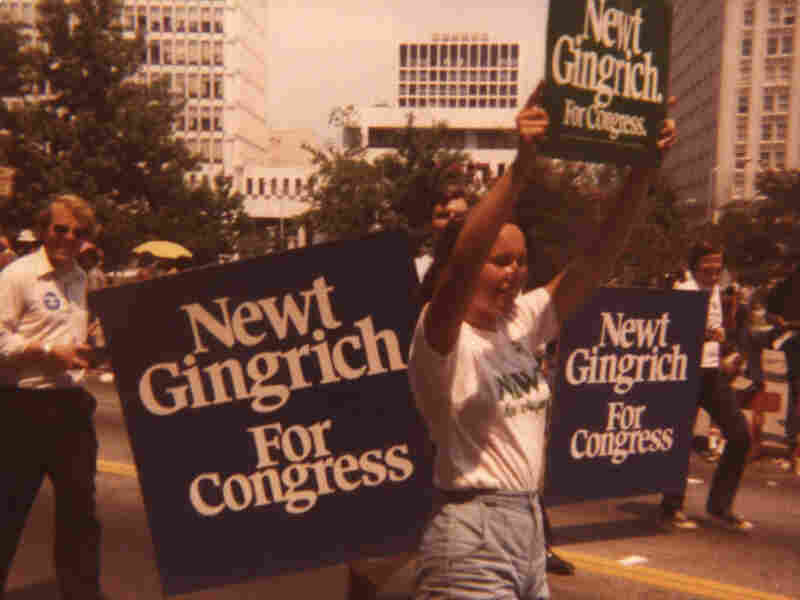 Newt Gingrich's daughter Kathy marches in a campaign rally with supporters for his 1978 run for Congress. He won that race and served in the U.S. House for 20 years, including four as speaker. Born: June 17, 1943 in Harrisburg, Pa.
After losing his first two elections, Gingrich did win a congressional seat in Georgia in 1978 and headed to Washington as one of the Young Turks who made it their goal to get a GOP majority in the U.S. House. "He's a guy who has tremendous ambition, tremendous motivation to win elective office and to be a leader," says Merle Black, a political science professor at Emory University. Black says Gingrich's experience as a professor helped him master the arts of public speaking and debate. "He has a lot of political skills, in that he can be very succinct in terms of, 'Here are two or three things that we need to talk about, focus on. Here's what I'd do: Bang, bang bang,' you know, like that. And he has enormous kind of media skills in terms of doing that — and his ability to think on his feet." Gingrich vaulted to prominence in 1980s and 1990s. In 1994, Republicans recaptured the House for the first time in 40 years, and Gingrich became speaker. As a politician, he has long stressed his background as a scholar, saying recently, "It's probably fair to say, without being negative about any of my friends, that I know more about American history than they do." Gingrich recently told Iowa Public Radio that his historical knowledge of the U.S. is important, even as voters consider whom to support for the GOP presidential nomination. "What it does," he said, "is it gives you a really rich background to go to, to analyze things, to think about things, to put in context what you would do in a way that if you don't know history, you can't possibly reinvent it." Gingrich's professorial style emerges in speeches and at debates, as does his old strategy of criticizing the media and uniting Republicans against their common political enemy — in this case, President Obama. "Let me just point out for a second that maximizing bickering is probably not the road to the White House, and the technique you've used maximizes going back and forth, over and over again," he said at a recent Republican presidential debate. The former speaker has risen to the top of some recent polls — and that's led to tough questions about money he received from mortgage giant Freddie Mac after he left office. Gingrich says he was not a lobbyist. He initially said he offered Freddie Mac advice as a historian, and later revised that comment, saying he acted as a strategic adviser. "That's just one example of the issues that he's gonna have to deal with," says Black, of Emory University. "There are also issues relating to his personal life and a whole string of other issues, because he's had a life outside of elective office since basically 1998." Even when he was out of office, Gingrich was outspoken on a variety of issues, in some cases holding positions that were at odds with many in his own party. That's led his campaign to add a new section to its website, devoted to explaining those positions and his past personal indiscretions. Back at the college where Gingrich taught, now the University of West Georgia, many on campus say they didn't know Gingrich was a professor there. But Rex Wilkinson, a sophomore from Columbus, Ga., says he has followed Gingrich's career partly because he is majoring in political science. "He's a really good guy. I think he'd make a good leader," says Wilkinson. "But he's got too many skeletons in the closet for the Republican nomination, so I don't know." Gingrich does have a lot of baggage — both political and personal. How he does in the GOP presidential race depends on whether he can make his campaign about the future instead of the past.